In the last few months we’ve seen the Australian Electoral Commission (AEC) tweeting about the redistribution of electoral boundaries. It’s amazing to see the size of some the electorates. The Northern Territory has recently been redistributed and contains only two electorates. One of those is the electorate of Solomon which contains Darwin and parts of Palmerston and is 190km2, the other is Lingiari which encompasses the whole rest of the Northern Territory at 1,348,157km2. But Lingiari is not even the largest electorate in Australia. The electorate of Durack in WA encompasses more than half that state, while the electorate of Grey in SA takes up about three quarters of that State. There are also large electorates in the other states. So why are our electoral boundaries set up this way? Our Constitution states that members of the House of Representatives must be chosen by the people and that the number of MPs must be roughly double the number of Senators. It also states that the number of MPs per state must be in proportion to the number of people living in the State. What this means is that every person’s vote in Australia is of about the same value. At the last count by the AEC in December 2016 we had 15,850,133 enrolled electors. With 150 electorates (you might have also heard them called divisions) this means that the average number of electors is 105,668. Although there are exceptions to this, and the Northern Territory is one of those. The number of electors enrolled in the NT when the redistribution began in October 2015 was 129,571. These electors have to be split into two groups with a maximum difference of 10%. When they were redistributed each of these electorates had just over 60,000 electors. Since that time the electorates have grown and one now has 65,752 and the other has just over 71,731. Why would the Northern Territory be different to the other States? The Commonwealth has allowed each of these territories two seats in the House and two in the Senate. 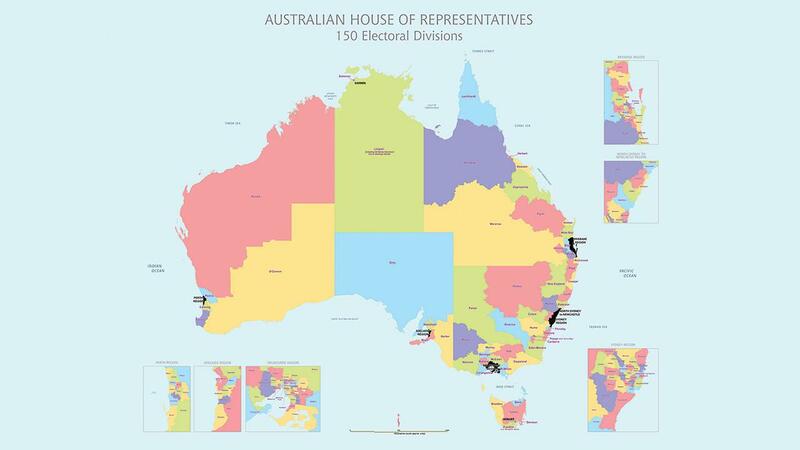 But the Commonwealth can change this representation if they like. For instance in the past the NT has had one seat in the House and the ACT has previously had three. The number of electors at the last boundary change in the ACT was 269,624, which is more than double the number of electors in the Northern Territory. Based on the latest figures available from the Australian Electoral Commission, the NT electorate of Lingiari is the smallest at 65,752 in Australia and the ACT electorate of Canberra is the largest at 144,391. The six original states, are bound by the Constitution. At federation each state was given seats in the House of Representatives, which are outlined in section 26 of the Constitution. These were NSW 26, VIC 23, QLD 9, SA 7, WA 5 AND TAS 5. This meant there was a total of 75 MPs. There was also six Senators per state to meet the stipulations of section 24 that the House be about twice the size of the Senate. There is only one of these states that still has the original number of MPs and that is Tasmania. This state also has the lowest number of electors per electorate after the NT. All five of the Tasmanian seats have between 73,000 and 78,000 electors. Section 24 of the Constitution states that the minimum number of MPs per state is five. The other States on the other hand, being bigger and including more electorates are more easily able to be split into nearly equal numbers. NSW now has 47 seats, VIC 37, QLD 30, SA 11 and WA 16 (these numbers have gone up and down over the years). Apart from the two ACT seats, the largest electorate is McEwen in Victoria with 135,618 enrolled voters. The last time that state was redistributed was in 2010, which means they are likely to have their boundaries redrawn later this year. Currently the average number of voters per Victorian electorate is 108,478 which means the range between the number of electors should be 97,629 to 119,325. Why might the averages be a bit out of whack at the moment? Before our last election in July 2016 the AEC advertised heavily about the Senate voting changes. These ads played for a few months across the nation. We here at CEFA found them very effective. As well as alerting people to the new Senate voting methods it was a prompt that reminded people to enrol to vote. It has been stated that this election had one of the highest enrolments ever. But that doesn’t mean that the extra enrolments were the same across every electorate. Some areas had higher levels. Let’s just look at McEwen. At the 2010 redistribution it had 90,003 electors, meaning it has grown by 45,615. Bruce is the currently smallest electorate in VIC with 96,351, but has only grown by 879 electors since 2010. We’re throwing a lot of figures around (sorry if it’s confusing), but what this really highlight is the reason for the redistribution and redrawing of electoral boundaries is found in constitution. They need to be as even as possible so that we have a vote that is equivalent to each other. In 1901, when the numbers of MPs and Senators were directly stipulated in the Constitution, the population of Australia was 3,773,801. Since that time the population has grown nearly six and half times. The ABS says the population today is 24,378,420. However, in that time our parliament has only doubled. This means we are much less represented today. Research tells us that we are much less likely to know or see our elected representatives and that our trust levels in them continue to decline. Do you think that if we were more represented, like we were at federation that this might change things? Or do you think Australians would be even angrier at having to pay salaries for more politicians? Here at CEFA we believe educational programs, particularly for young Australians will make a big difference to peoples understanding of our Constitution in action.